Tips are a non-negotiable part of eating out: If you go to a restaurant and you finish your meal, you will tip your server. This is a societal norm, even if restaurants still present the illusion that it is optional. Yet there is one situation in which more and more people seem to believe that it’s okay not to tip: When you wish to make a statement about your beliefs. Receipt-slip sermonizing — leaving a message for your server on your bill, usually without tipping at all — has become a news meme in recent years, and it’s a truly gutless practice that’s as much about wresting control of a low-stakes situation as it is about saving a few bucks. 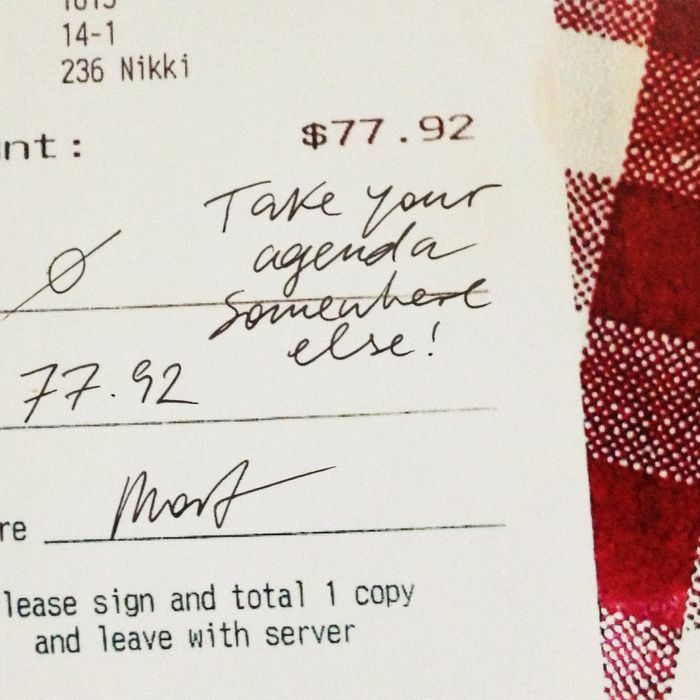 As Bill Maher recently pointed out, receipt messages tend to have an overwhelmingly conservative, Christian bent. But the nature of the messages isn’t the real issue: It would be just as loathsome if a customer stiffed-then-scolded a server because he or she didn’t believe in marriage equality. The real problem with reproach-via-receipt is that it exemplifies the worst kind of diner: those who believe that they are somehow superior to their servers. If stiffing a server were only about saving some money, there wouldn’t be a note. Cheapskates don’t explain themselves. But the people who sermonize on their sales slips have a clear desire to shame their servers, to make them think that they somehow aren’t worth paying. This is slightly less spineless than writing a bad Yelp review or leaving a nasty anonymous comment online, but it’s more malicious, because there’s a clear effort to try to hamper another person’s livelihood. Holding back $15 isn’t going to make a waiter reevaluate his life choices; it will let him know the customer he just served is a coward. Staff-stiffing customers know that they’re insulated from real retribution because even if a server wants to confront them, they probably won’t risk their job to do so. So what can be done to curb this behavior? The customer who left the note about giving God 10 percent did get outed as pastor Alois Bell, who eventually expressed regret for the note. But the server who got stiffed lost her job anyway. Public shaming isn’t an effective tactic, since restaurants won’t sacrifice customer privacy to protect their staff members against this. Receipt sermonizing, then, is another point in favor of abolishing tipping outright and paying higher wages instead: If service fees became mandatory, the self-righteous would have one less opportunity to degrade others. *This post has been edited to remove a receipt-sermon example that was just a hoax.